For those of you who aren't fond of Halloween, this is the last in the series! I am pretty sure many elementary school teachers are also grateful Halloween falls on a Saturday this year as it will be all over by Monday. They won't be dealing with the sugar highs this weekend! So in celebration for all the sweet delights, let's enjoy some of our favorite candies in calorie-free jewelry by some pretty amazing artisans! Chocolate. Diamonds. How decadent can you get? World Trade Jewelers produce a jewelry line inspired by the chocolate treat Hershey's Kiss complete with the slogan "A kiss that lasts forever". Designs vary from simpler sterling silver versions costing $49 to diamond encrusted creations. The line is available at several jewelry stores as well as at Zales. The Sweet Candy Delights by Erika Price on Etsy look good enough to eat! The polymer clay beads so resemble the actual licorice candy mix known as Licorice Allsorts in England where Erika comes from. The real sweets contain licorice, sugar, coconut, aniseed jelly, fruit flavorings, and gelatin but Erika's are made from polymer clay. Erika donates 100% of the profits of her jewelry sales to charity. There is even a 10%-15% sale for new and returning customers. The chosen charity until Christmas is the Etsy Project Embrace which supports cancer research. 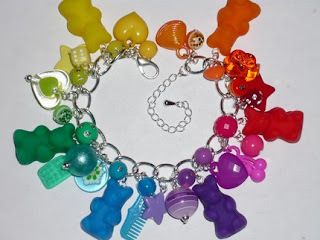 Goldenhissingmonkey's Etsy store Jillian's Jewellery has a delightfully colorful bracelet sporting several gummy bear charms. The polymer clay bears were all handmade using a set of molds Jillian made herself from the real candy! Anyone who makes MandM candy is a shoo-in for this is my favorite candy! 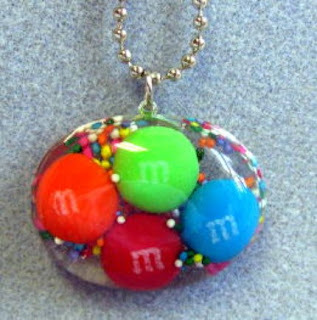 Wanda's Etsy store Two Crafty Mules on Etsy has this pendant made from real MandMs and candy sprinkles. But don't worry, your diet's safe as the candy is encased in resin! 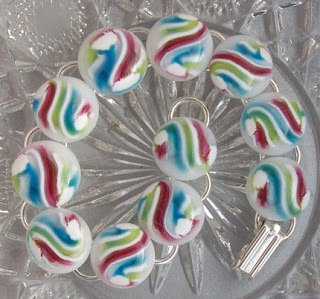 Laura of Galaxy Glass Studio on Etsy has this delicious lollipop fused glass/lamp work bead bracelet you just want to lick! 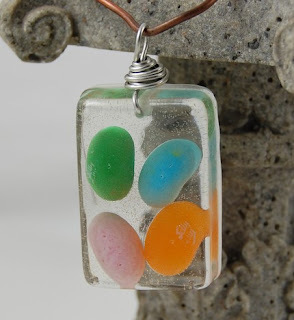 I really love this real jelly bean embedded resin pendant by AardvArt on Etsy. It is fun, funky and colorful! This tricolor candy is popular in North America around Halloween and is meant to resemble corn. 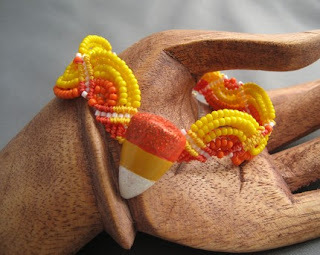 Bead artisan, ss10001 on Etsy has this gorgeous candy corn bracelet where waves of beads compliment a candy corn inspired focal bead. 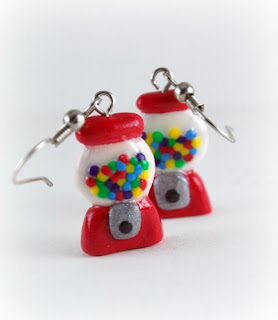 DIVINESweetness on Etsy makes all kinds of yummy looking polymer clay treats including this kawaii (cute) gumball machine earrings. 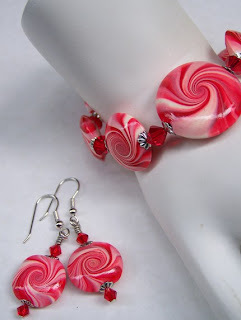 Lisa Suver of Fanceethat is a multi-talented jewelry artisan as she does all kinds of techniques including this bracelet and earrings set of polymer clay peppermint twist inspiration. 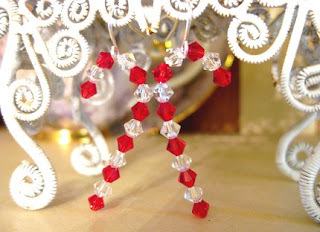 Nea's Treasures on Etsy has this sweet pair of Swarovski candy cane earrings which makes a wonderful gift at Christmas time. Dandy candy! My sugar cravings just skyrocketed. Now I'm really, really hoping there is leftover candy after the trick or treaters come by tonight. Are you? Sweet! 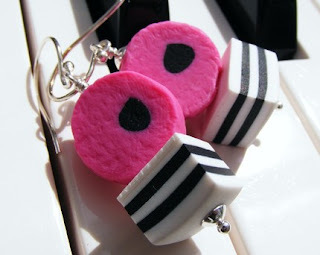 Love the polymer clay jewelry the most, but that Hershey's Kiss is pretty awesome too! Now this is a trend I can get behind! I have such a sweet tooth, I would have trouble picking pieces based on which ones are cutest vs which ones look like they taste the best! Hmmm! Mmmm, beautiful AND delicious jewelry! What fun ideas...it often amazes me what people come up with! These are all great ideas! I especially love the candy canes!